► What were the other lights seen by Col. Halt? ► Where was the landing site? ► What were the landing marks? ► Were the radiation readings significant? ► What route did the airmen take into the forest? ► Why did the airmen think that something had landed in the forest? ► Was it a hoax that got out of hand? ► Was the UFO detected on radar? Why did Col Halt not see the flashing light sooner? This is an intriguing question for which the Orford Ness lighthouse offers a natural answer. Recall that Col. Halt’s men had called him to the scene with the words “The UFO is back”, meaning that they had already seen something out there. But, as we hear from Col Halt’s tape recording, no one pointed out the flashing light to him until he had spent some time at the site. Where had it got to? Had it gone away and come back again, or was it there all the time but hidden? In my view, the second answer is correct. The Orford Ness lighthouse is directly visible from only a limited area along the forest edge, so anyone just outside this range would not see it – even a few yards makes all the difference. On this scenario, the landing site that Halt investigated was probably just to the north of the area from which the lighthouse is visible. Only by moving a few paces to the south would the flashing light on Orford Ness be brought into direct view. Why Col. Halt’s men did not immediately show him the flashing light which they had originally called him out to see is an intriguing question which only they can answer. Of all the questions that need to be answered about the Rendlesham Forest UFO case, the most significant has always been the following: what was the flashing light seen in the forest by the airmen on both nights? This was the first aspect of the case that I addressed once the story appeared in the News of the World in 1983 October, and I was quickly convinced by the suggestion of local forester Vince Thurkettle that it was the Orford Ness lighthouse. Eyewitness evidence that has come to light since then strongly supports this identification. Commonly raised objections to this identification are here examined and found to be invalid. Within days of the story breaking, I visited Rendlesham Forest at night with a BBC TV camera crew to interview forester Vince Thurkettle and film the lighthouse flashing as seen from the area where Col Halt, the prime witness, had seen his flashing UFO. However, it was not until many years after my initial visit that I was able to pin down exactly where Col. Halt had been standing. The clue came from an online interview Halt gave to Salley Rayl on the Microsoft Network in 1997 May, by when he had retired from the air force and felt freer to speak. In this interview, the existence of which was brought to my attention by James Easton, Halt noted that the UFO had appeared closely in line with a farmhouse “directly in front of us”. Armed with this new lead, I returned to Rendlesham Forest in 1998 October. Scouting around at the forest edge, I discovered something that I had not appreciated previously: the top of the lighthouse peeps through a gap between distant trees, and can be seen directly from only a limited area of the forest. Remarkably enough, when I was positioned so that I could see the lighthouse through the gap in the distant tree line, the farmhouse lay right in front of me, in the same line of sight, just as Halt had described it as lining up with the flashing UFO. The photograph I took on that occasion has been published in various places, but at that time the trees were still in full leaf and the crop in the field had just been harvested, quite different from the situation in the dead of winter when Halt and his men chased their flashing UFO across this field. To get a better idea of what Halt might have seen, I returned to the site on 2005 April 3 in the company of fellow researcher Dave Clarke when there was less foliage around, this time armed with a digital camera, and captured the view below. The upper image is the full-frame view with the lighthouse circled; the lower one is a portion of the same frame enlarged. These photographs demonstrate once and for all that the lighthouse was not “30 degrees off to the right” as Col Halt has since claimed (see next page). He evidently mistook another light for the lighthouse – very likely the Shipwash lightship, which lay in the direction he described. Orford Ness lighthouse seen from the eastern edge of Rendlesham Forest in daylight. I took this photograph in 2005 April from the forest edge, looking east across the neighbouring field towards the lighthouse with the farmhouse in the foreground. I think that it shows us a daylight version of the view that Col. Halt had when he looked from Rendlesham Forest across the field towards the “winking eye” UFO. The tilled soil beyond and to the left of the farmhouse is what I take to be the “second farmer’s field” described by Halt (see below). For a wider-angle view of the field from the same position, click here. Local resident Tony Nelson of Wickham Market has sent me a super-telephoto view of the top of the lighthouse peeking over the distant ridge, taken by him in December 2006. To see it, and read more about the visibility of the lighthouse, click here. The farmhouse in my picture, at Capel Green, is identified in Jenny Randles’ books as Victor Boast’s house. The houses to the north of it (off the left of my pictures), Green Farm, are lower and among trees. The ground falls towards Butley River, two miles to the east. Beyond the river the ground rises again to a fairly flat ridge, with a gap between two stands of trees through which the white top of Orford Ness lighthouse can be seen. Although a shield blocked the beam of the lighthouse from the town of Orford itself, it did not extend far enough to block the beam from this part of the forest, as may be clear from the pictures on this page. From Halt’s own description that the farmhouse could be seen right in front of them with the flashing UFO almost in line with it, I think I was standing pretty much where Halt and his patrol crossed the fence, which is particularly low and easy to step over at this point. As seen on a recent map of the area, my position was about the middle of the letter G in the name Capel Green. Col Halt confirmed that this was indeed where he crossed into the field in a programme called The UFO Hunters broadcast on the History Channel in 2008 – see this screen grab. 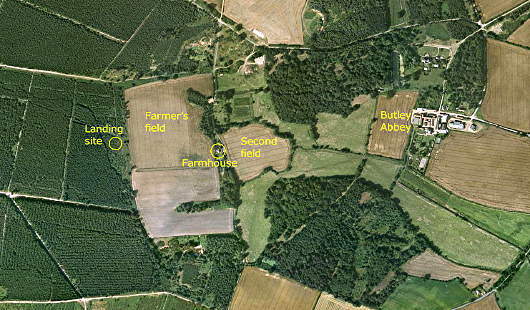 I have labelled the landing site, the farmer’s field and the farmhouse; the Orford Ness lighthouse lies off to the right. After walking across the field and past the farmhouse towards the flashing light, Halt mentioned crossing a second farmer’s field. This would seem to be the next field in line past the farmhouse which I have labelled accordingly. Comparison with the Ordnance Survey map shows this field is bordered by a brook which is apparently the “creek” which Halt, on his tape, reports crossing. (He and his men apparently fell into it, too.) See the region on Google Maps. Content last revised: 2013 August. © Ian Ridpath. All rights reserved. At the end of June 2013, the Orfordness lighthouse was turned off permanently. The building is threatened by coastal erosion and will now be allowed to fall into the sea. Hence I have changed all references to it into the past tense. Could the lighthouse be seen from East Gate? No it could not. Due to the contours of the land and the intervening trees, the flash from the lighthouse did not become directly visible until you were well into the forest. This helps explain why it came as such a surprise. It is sometimes argued that the airmen at East Gate would have seen the lighthouse every night and hence could not have mistaken it for a UFO, but this is not true. Their own statements make it clear that they were not familiar with the lighthouse at all. However, the local police, who were familiar with the lighthouse, were of the opinion that it was the light that had been seen – see the comment from Inspector Mike Topliss of Suffolk constabulary near the bottom of this page. As Topliss noted, under certain atmospheric conditions the loom of the lighthouse beam could be seen over the trees or could reflect off low cloud, causing odd visual effects. It is possible that these effects added to the overall strangeness of the sighting. The height of the light is just right! According to this Trinity House information page, the Orfordness light (they spell it as one word) was 28m above mean high water. Hence it was easily visible above the intervening ridge, which has a maximum height of 19m (OS spot height) in this region. The position at the forest edge from which I took these photographs at left is between the 20-m and 15-m contour lines on OS maps. Anyone standing here is close to the same level as the lighthouse beam, and so it would have shone directly into their eyes. A good analogy might be the headlights of aircraft, which look intensely bright when aimed in your direction but soon fade as the aircraft turns. You can read more about the visibility of the lighthouse here. How bright was the light? At the time of the Rendlesham Forest UFO incident, the Orfordness lighthouse was one of the brightest in the country with an intensity of 5 million candelas, according to official Trinity House figures. Only St Catherine’s on the Isle of Wight (5.25 million cd) and Strumble Head in Pembrokeshire (6 million) were brighter in England and Wales. Subsequently, the bulb in the lighthouse was changed twice, and the appearance of the beam changed along with it. At the time of the UFO sighting in 1980 the lighthouse was fitted with a 3-kilowatt 100-volt filament lamp. That was replaced in 1991 with a 1 kW 240V mercury vapour discharge lamp. The final bulb, installed in 2000, was a 70-watt 12 volt metal halide lamp which ran off batteries. According to the Trinity House website, its intensity was 635,000 candelas, only about 13% of the value in 1980. Hence many visitors to the site never saw the full effect of the light as it appeared at the time of the UFO sighting. The old bulbs from the lighthouse are kept on display in the bar of the Jolly Sailor pub in Orford. Another complicating factor when comparing the later appearance of the light with 1980 is that the visibility of any distant light is strongly affected by atmospheric conditions. Anyone visiting the site on a night of low atmospheric transparency would not have seen the full intensity of the Orford light. Fortunately my early visits were all on clear nights, when I could appreciate how bright the beam appeared. Indeed, it looked to be no more than a couple of hundred yards away between the trees, much as reported by the original witnesses. Scattering in the atmosphere causes reddening of a light (see Optical phenomena and optical illusions near lighthouses by C. Floor). The final metal halide bulb was not only much weaker but whiter than the old incandescent bulb in use in 1980. Even so, it could still appear yellow or even orange depending on conditions, as film maker Adrian Frearson demonstrated in 2008.